To make Touch Wiz respond faster, you can try the following trick. I have tested it on Galaxy S3, S4 and Note 1 & 2 and it really works. Open your Galaxy device Settings. Scroll down to Developer Options. In case you have Galaxy S4 or any Galaxy device with Android 4.2 or up, you’ll not be able to see Developer Options under Settings until you enable it. Tap all the 3 options one by one and set the Animation Scale configuration either OFF or to 0.5x (for less animation effect). Besides, you can also try turning “Force GPU Rendering” option ON by checking the box (avoid this step if you play 3D games on your device). Finally, you can free some more RAM by setting your device to kill any activity as soon as you leave it. To do this scroll down to “Do not keep activities” option and select it. You are done now! Leave the Settings interface and play with the TouchWiz UI. You should now experience significant improvements in the lag-delays and enjoy faster response on your Galaxy phone or tablet. Customization and flexibility lie at the core of Android and it is this potential that draws more and more people to it, making it the most loved platforms for mobile devices. I see Android as an assertion of freedom against some other major operating systems like iOS and Windows Phone. At the same time, it must be admitted that this liberty comes tagged with a check and can be experienced by only those who are adventurous in nature. An Android device in its maiden state is just a little better than devices from its opponents, but once rooted, its leaves all others far behind. We do not mean that customization is not possible altogether on an unrooted phone or tablet. You can install 3rd party launchers and icon packs and decorate your home screens with a variety of widgets. However, the range of such type of personalization is limited to a certain level. By rooting yourAndroid device, you get the key to unlock the whole next level of customization. If you have root access on your device, you can flash custom ROMs and mods to achieve not only true customization, but also improve its performance significantly not possible otherwise. Also Read: To Root or not to Root, that’s the Question! What is a Custom Framework? In case you have a rooted device but you do not wish to install custom ROMs or mods, or a custom recovery is not available for it, there is yet another way of tasting the custom flavors of Android. And this can be done byinstalling a custom framework on your phone or tablet. All such frameworks modify the system.bin file replacing the original codes with those of the custom framework. The hacked system core then starts allowing changes imposed via custom modules. The best part of this whole business is that you can customize your device with stock firmware. If you are not new to Android, you must have heard about some custom frameworks for Android like JKay, Xposed, 3Minit, etc. Developed by XDA member rovo89, the Xposed Framework is most popular of all its peers because of its potential and compatibility with almost all Android devices with Android 4.0 or above that house an ARM processor within them and are rooted. “Installing a custom framework” might sound a little geeky and complicated task to most new users. On the contrary, Xposed Framework can be installed very easily like a simple APK. All you have to do is to download theXposed Installer app and install it on your device. Then open the app, select Framework and tap on the“Install/Update” button. The app will ask you to grant root permission, do it and wait for a while till you get an on-screen confirmation that the framework has been installed on your phone. Now you have a custom base framework that can change the way you use your device with the help of compatible modules. Xposed Framework will not add any functionality to your device that can be used individually. Just search for Xposed modules and then you will be able to customize your device in various ways. The module files for the framework come as simple APK files and can be installed normally. As we already mentioned above, it is the modules that let you customize your device and therefore, you will have to find and download the desired modules and install them separately on your device. Fortunately, the developer has now added the option to download modules right from the app’s interface. Open Xposed Installer and tap on“Download” option. You will now see a long list of available Xposed modules that can be downloaded. Just select the module you like and hit the Download button. Besides the modules available in the app, you can find more at forums like XDA and others. I have downloaded 2 modules, namely Wanam Xposed and Icon Changer on my Galaxy S4 with stock rooted ROM and both of them work perfectly. After installing the modules, do not forget to select them in Xposed Installer. Launch the app, tap on “Modules” and check the newly installed module. 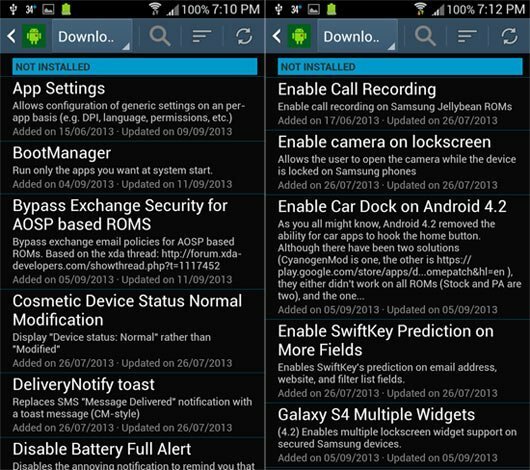 You can download the latest version of Xposed Installer app from here, and get the module APKs from here. You cannot get a perfect user interface with any smartphone or tablet unless you got a good PC suite tool installed on your computer too. Switching to Android years ago was a great move on my part but there is one thing I always miss in Android, and that is the lack of a PC Companion that is rich in functionality and helps in performing various tasks like managing contacts, sending messages, installing apps from the market and also individual APKs, managing media files,backing up and restoring data etc. 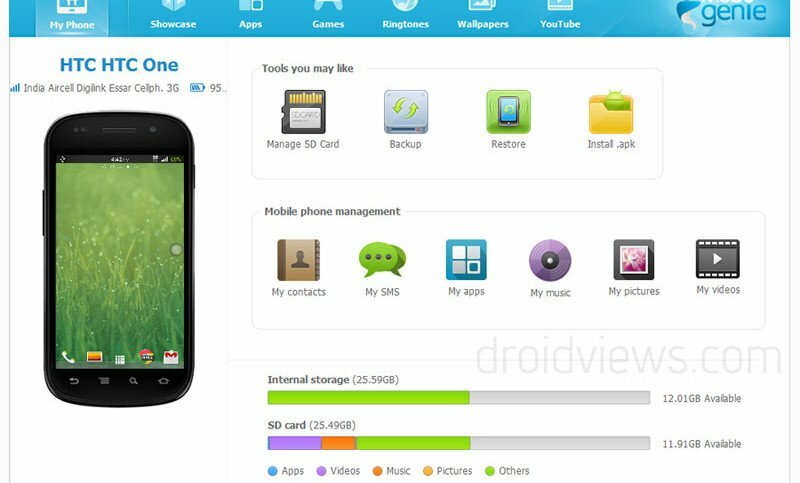 Mobogenie Android Manager is an all-in-one tool for Android devices that can do almost anything you might expect from a useful PC companion for your smartphone or tablet device. It’s very lightweight utility (only about 20 MBs) as compared to those bulky PC Suits you might be using. A Must Have Tool for Android Users ! Shows your device’s info with network signal strength and battery charging percent. Backup and restore apps, contacts, messages, music, images and video files. Install Apk files stored on your PC. Manage your apps, images, videos, music, contacts, messages, etc. Install apps and games directly from Google Play to your device. Download YouTube videos in MP4, FLV and 3GP formats. Download your favorite ringtones and wallpapers from all over the web. Interestingly, Mobogenie uses your computer’s data connection for downloading all stuff and then it pushes them to your device. Windows XP, 2003, Vista, 7 and 8.